There are some exciting new certification opportunities that I wanted to share with my readers. First, for those who want to prove that they have VMware knowledge in a simple, affordable way, VMware has launched the VMware Certified Associate (VCA) Certification. There’s even a 50% discount right now to get you started. 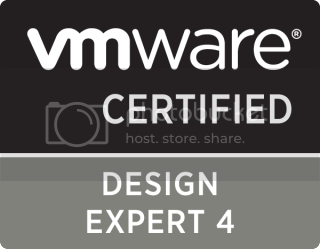 Second, for those of you who aspire to achieve the VMware Certified Design Expert (VCDX) designation, there are some great resources. If you want to dive deep into Software Defined Datacenter Architecture, you should really check out the VMware vCloud Architecture Toolkit. Finally, there is an excellent VCDX boot camp video series starring Rawlinson Rivera, Mahesh Rajani, Ben Lin, Christen Patterson, and John Arrasjid. Good luck to everyone whatever path you are on. I am very excited to announce that I’m starting my new role at VMware today. I have been fortunate to work with VMware products for many years and help many customers in a consulting role. I have also been able to contribute to and learn from the VMware community through blogging, articles, speaking, and writing books. Now I will have the opportunity to contribute to the VMware community and customers by working at VMware as a Senior Technical Marketing Architect. I’m sure this new role will bring many new challenges and I’m looking forward to meeting them head on. This is the Live Blog of OPS-CIM1926 ? 5 Must Know Design Considerations for Planning Capacity When you are 50 Percent or More Virtualized. You’ll find my recap of the session below. Samuel McBride — VMware, Inc. This session will discuss capacity planning. Monica Sharma is speaking now. The right management tools allow the ratio of VM per Admin to be much more efficient. We can manage more with fewer resources. Capacity problem areas can get amplified with higher consolidation. What are my used vs allocated resources? Do I have the need for burst demand? How can we stay ahead of demand? This is the Live Blog of INF-VSP1168 — Architecting a Cloud Infrastructure. You’ll find my recap of the session below. Aidan Dalgleish — VCDX # 10 VMware, Inc.
Duncan Epping — VCDX #007 VMware, Inc.
Rawlinson Rivera VCDX #86, VMware, Inc.
Great advice for consultants and anyone going for the VCDX certification. What does the environment look like today? How will size / scaling impact your Design / Project? This is the Live Blog of INF-BCO2655 — VMware vSphere Fault Tolerance for Multiprocessor Virtual Machines — Technical Preview. You’ll find my recap of the session below. Shrinand Javadekar has taken the stage and is discussing vSphere availability features to date (NIC-Teaming, HA, DRS, vMotion, storage multipathing, etc.). This session will concentrate on continuous availability with Fault Tolerance. VMworld 2012 – It’s All About the Sessions, Or Is IT? This is probably one of the coolest rooms at VMworld 2012. All those worn and weary from the barrage of sessions can relax and take it easy amongst fellow virtualization enthusiasts. They even have a “Charging Valet” where you can drop your device off to be charged while you relax. Pretty cool. This is the Live Blog of INF-VSP2448 — Automating Bare Metal to the Cloud and Beyond. You’ll find my recap of the session below. Alan Renouf is on the stage and talking about the history of PowerShell and PowerCLI. PowerCLI will be the basis for the automation featured in the presentation. He is discussing some basic PowerShell and PowerCLI cmdlets and how easy it is to create scripts by piping cmdlets into other cmdlets. PowerCLI 5.1 — What’s New? This is the Live Blog of INF-NET2161 — VMware Networking 2012 — Enabling the Software Defined Network. You’ll find my recap of the session below. Software Defined Networking must provide an abstraction layer for the network similar to the way there is a hardware abstraction layer for virtual machines today. The goal is an operationally efficient environment to provision networks quickly and on-demand. With the release of vSphere 5.1 you can define logical networks with features such as vShield Edge, App, and Endpoint, and utilizing vXLAN technology. The vCloud ecosystem framework will allow 3rd party partners to participate in Software Defined Networking with their own solutions. You can configure a vDC in minutes. This is the Live Blog of the VMworld 2012 General Session Day 2. You’ll find my recap of the session below. Steve Herrod, CTO, VMware, Inc. is on the stage now. He’s recapping the general session from yesterday about VMware’s strategic direction towards true cloud infrastructure. Today he is talking about end user computing and access to data in new and different ways. VMware View is a big component of this transformation. With View 5.1 there are more clients for more devices. The user experience is vastly improved. There was even a 3D-Gaming experience running on View desktops in the Hands on Labs. He is announcing a partner ecosystem of appliances like the Cisco ISR G2 plus VMware View for branch office View deployments. Up next is Mirage. This is a technology that is brought to us by a recent VMware acquisition. Mirage helps to break apart the desktop into distinct components and allows offline access from a managed physical or virtual desktop. Mirage allows in place upgrade to Windows 7 in the background while a snapshot is taken of the machine. After the upgrade, the user reboots and they have windows 7. Mirage also has a copy of a user’s devices and can restore them as a virtual machine. Demo recap.